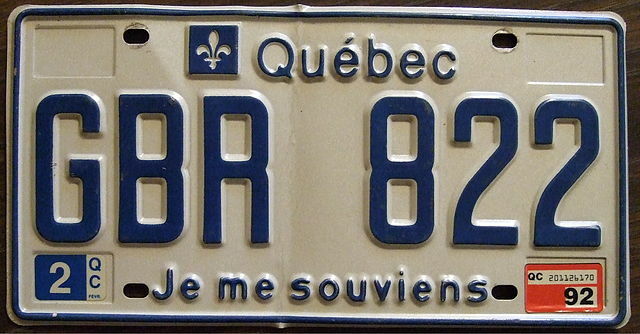 Quebec's motto, which appears on the licence plates of vehicles registered in Quebec, is Je me souviens ("I remember"). What the Quebecois remember, it is often said, is the English conquest and their determined struggle to maintain their identity in the face of relentless pressure to assimilate to English Canada. But deep down, or so I would say, what they remember is that New France was entirely their creation, that they are a unique people newly born in the soil of Quebec along the edges of the St. Lawrence river in the 1600s. They remember that they built themselves through their own natural procreation with minimal immigration. The Quebecois are the purest Canadiens with the strongest sense of ethnic group identity and territorial rootedness in North America. The people remember — but the elites want them to forget. They want them to cease identifying themselves as a unique race. They want them to remember only the French language. The treacherous elites now tell the Quebecois that their culture is about diversity-born-in-immigration. 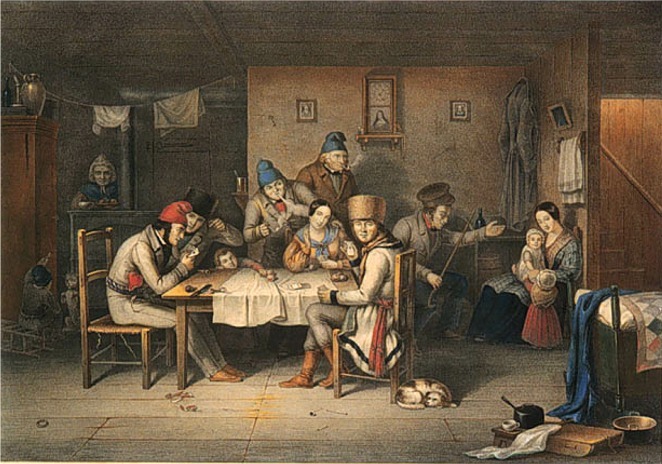 "The Revenge of the Cradles"
For two centuries, or from about 1670 to 1850, the Quebecois enjoyed fertility rates "nowhere to be found" in other Western nations. But starting in the 1960s, the fertility rates began a rapid decline, collapsing in the 1980s and 1990s, below replacement and below the Canadian national level. The old loyal elites, with the Catholic Church in the front lines, always believed that "strength in numbers" was the best strategy of French settlers to survive in an English continent. The Church was an ardent promoter of la revanche des berceaux, the revenge of the cradles, a pronatalist strategy of survival. This all ended in the early 1960s. Having reduced their sense of peoplehood to the French language alone, the current elites have been brainwashing the population into believing that the Quebecois are just one group among many "francophone" peoples in the world. Survival, they are now told, hinges on the importation of millions of French-speaking Haitians, Moroccans, Algerians. But we defenders of all Europeans in the world must remember that the Quebecois were a whole new people born in the soil of Canada, without much immigration. Jacques Cartier discovered and explored Canada's great arterial highway in the 1530s, the St. Lawrence, but New France really began when Samuel de Champlain planted the first permanent settlement at Quebec in 1608. Champlain was the first governor of New France vested by the French Monarchy with the authority to defend the colony, dispense justice, regulate the fur trade, and legislate. By 1627, after almost 20 years of formal government, there were only 65 colonists in New France. By 1645, the population was still only 400, and fifteen years later, in 1660, it had grown a bit to 3,215 settlers spread tenuously along the edges of St. Lawrence river. Life was incredibly hard for these scattered settlers, threatened by constant Iroquois raids; France had to send them supplies to keep them alive. Efforts by France and the chartered companies had failed to entice French immigrants to settle in New France. In 1665, the Monarchy commissioned Jean Talon to find a way to increase the population of New France. In 1666, Talon conducted a census of New France, the first census conducted in North America. According to Talon's census, which showed that there were 3,215 people in New France, there was a marked imbalance in the number of men at 2,034 versus 1,181 women. This Census also showed that there was a high number of unmarried settlers, and that the largest single age group were 21- to 30-year-olds. With these facts at hand, Jean Talon devised a population policy that would lead to the creation of a distinctively Canadien people almost wholly native-born. First, he encouraged early marriages, gave baby bonuses, offered pensions to fathers of large families, and fined young men who refused to marry. Second, he called for France to send young healthy girls to New France to make up for the male-female imbalance. These policies were a success; by the time Jean Talon departed in 1672, a mere few years later, the population of New France had risen to more than 7,000. 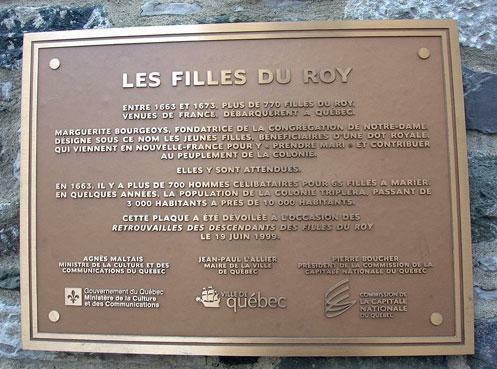 They were fortunate replenishing themselves with these young desirous immigrant girls, "filles du roi" (the King's Daughters), most of whom were married and pregnant within a year of arrival. After immigration reached a peak of 1,698 in the decade of 1660-1669, with the arrival of the filles du roi, it declined to an average of about 500 immigrants per decade up until 1750-59, when it increased to 1,751. Yet, the population continued to increase steadily; by the first years of 1700s, it has been estimated that the number of settlers along the Saint Lawrence and the Acadian peninsula was around 15,000 to 16,000. By 1730, it increased to 42,700, and by 1754 to 55,000; and by the time of the conquest in 1763, the French-speaking population numbered about 70,000. The total number of immigrants from the time of Samuel de Camplain's settlement at Quebec in 1608 up until the conquest in 1763 was about 10,000. In other words, roughly speaking, immigration contributed one seventh (1/7) to the total population growth of New France from its beginning to its conquest. After the conquest, immigration, as one historian put it, was "almost non-existent". Yet the population continued to increase at an accelerating rate, reaching 90,000 by the 1770, and 330,000 by 1815, and 890,000 by 1851. This increase, to cite another historian, "was mainly attributable to the continuing high birth rate within the French-speaking community". This demographic increase, from the 1660s through the 1800s, was driven by the "exceptionally high" fertility rates of women in New France, 5.6 surviving children on average, 30 per cent more children than comparable women who remained in France. By 1950, the Quebec population was almost 4 million. While it is true that "by the early part of the 1900s, there had been some fertility declines, the fertility rate of Quebec still exceeded that of Canada by a notable margin" up until 1960. Explaining this decline, however, is not the subject of this article. It is simply that Quebec was fundamentally created by a new people born through natural procreation. The current meme that Quebec was created by immigrants is a malicious act of deception intended to manipulate the people into believing that the post 1960s high levels of immigration do not constitute an abrupt break with Quebec's history. Government officials and the Roman Catholic Church promoted an ideology of "strength in numbers", often referred to as la revanche des berceaux — the revenge of the cradles. Held to be a means to overcome Québecois subordination to English Canada, this pronatalist strategy was essentially successful. As Henripin and Peron (1972) have noted, between 1760 and 1960, despite losing approximately 800,000 people to emigration, French Canada's population multiplied 80 times. In the same period, the world's population increased only 4 times, while that of Europe grew just 5-fold. Moreover, Quebec's exceptional reproductive rates caused concern in English Canada, for "if the French continued to reproduce at the current rate, they would eventually overrun the country". The success of this domestic pronatalist policy was largely made possible by the simultaneous promotion of seigneurialism, the system of land distribution and land holding in New France. While the intention was to transplant to New France the feudal system of the mother country, this system developed in the colony along very different lines. The Crown granted a large tract of land to a seigneur, who would then subdivide the land into smaller parcels to tenant farmers in exchange for rents and services. The objective of the Crown was to encourage cultivation as well as orderly settlement by granting the seigneur with administrative, military, and judicial authority at the local level, justice over disputes between his tenants, or habitants, as they came to be known. In contrast to France, these tenants enjoyed considerable rights and privileges, with very manageable rents, allowing them to prosper as long as they worked hard. Seigneurs could no lived off their rents in idleness but were obligated to cultivate their lands no less than the habitants, "many of them labouring beside their tenants". The economic difference between these two classes was not significant. The image academic Marxists like to convey about oppressed habitants burdened with seigneurial dues is belied by the observations of contemporaries from France about the "spirit of independence", the "happy, cheerful", "very comfortable" lives of the habitants. Obviously, hard work was a given for all; but overall the standard of living of the habitants, once they were settled with their farms, was reasonably good. They had a fairly varied diet consisting of cabbage, carrots, celery, beans, lettuce, peas and onions, with most houses having their own bread oven, a variety of animals, with cows giving them milk, butter and cheese; chickens and eggs, pigs and bacon, with nearby forests abounding with wild berries and wild animals. This agrarian order was the foundation from which the Canadiens emerge as a new people right from the soil, through large families, traditional family values, hard work and self-reliance. This order is what made possible the high fertility rates of the Quebecois, which at one point brought fears to the English commercial elites in Montreal; who feared that if the French continued to reproduce at such high rate, "they would eventually overrun the country". We are now a long way from this world. 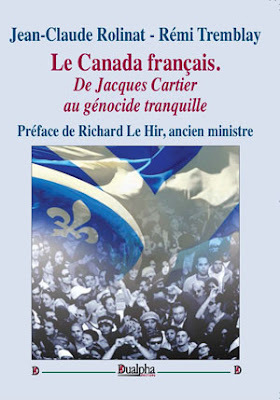 Quebec is being swamped by masses of non-European francophones happily grabbing the historical ancestry of the Quebecois at the behest of a traitorous elite determined to destroy their own ancestors for the sake of an allegedly superior mongrelized species without any roots, a truly docile and morally fake creation.